What if you’re going to hunt? Well, after getting lots of requests to publish the Gold Tip Hunter Pro review we finally come with lots of information which may be proven helpful for you. So don’t do hurry and discover all the deft features and clear your queries which is kicking up a storm in your little head. 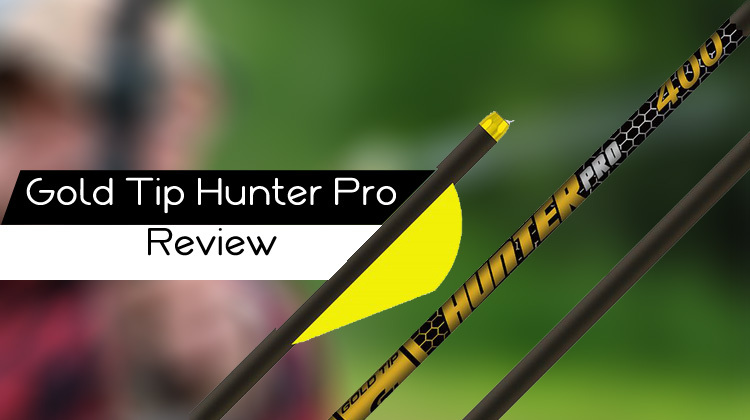 So let’s get started with Gold Tip Hunter Pro Review with its pros and cons. Surely you will lose yourself in the maze of archery world if you do not have proper knowledge in this specific area. As you are aware of the fact that there are lots of arrows are available with lots of different advantages. So which one is best to pick? Which can save your money with the desired quality? Among these Carbon, Aluminum, and wood made Gold Tip Hunter Pro are preferable for the newest technological advancement. So before choosing your arrow, you have to be clear about the features of your desired product. Now let’s talk about the main features of the Gold Tip Hunter Pro. I can guarantee you that after knowing the different quality and advantages of Gold Tip Hunter Pro you will be compelled to choose it. What is so special in this? Then let’s go through its Straightness & Stability, Speed, Durability, nocks, Sizes, Color and so on.. When you want to hit your target perfectly you have to confirm your arrow’s straightness. Gold Tip Hunter Pro is popular for its straightness. It is made of 100% Carbon Technology. Its tight weight tolerance and straightness help a hunter stay more accurate. It is enough accurate for hunting. When you want to be a perfectionist and you want to use them for 3Dshoots then it would be a perfect choice. The straightness of Gold Tip Hunter Pro is ±.001. Everything we like fast as a rocket. Why not in archery equipment? After taking any bow everyone’s first question is “How fast does it shoot? It is a very common question for every archer. So it is important to buy high-performed bows and also a gadget which boosts your speed. And nothing but lightweight carbon arrows can boost your hunting speed. If arrow mass increases then arrow speed decreases. In the same way while arrow mass decreases then arrow speed increases. It has ±0.5 gr weight tolerance, for that, it goes to the target with perfect speed. For competition and hunting, this arrow is perfect for its durable quality. The arrow is amazingly accurate and also very well made. This durable arrow will not break due to normal use. AN archer can use it again and again unless the arrow goes missing. So keep on enjoying your hunting withGold Tip Hunter Pro. This arrow comes with GTO nocks with bushings so it’s easy to use. But if you don’t like to use it default nocks than you can use in your ways. To remove the nock you have to use a drill bit in the shaft and swing this so that the bit can smash the inside of the nock. This arrow comes in four different sizes. 300, 340, 400 and 500. Product Dimensions for all sizes is 35 x 3.5 x 1.5 inches. The most interesting thing about archery is that you can customize your gear and arrows. You can choose or select your desired one. So if you are a black lover than this arrow is for you because it manufactures with black color. Price of the Gold Tip Hunter Pro is low as the product is for the pro level. So the price is very much affordable compared to its quality. Legal Disclaimer of the Gold Tip Hunter Pro is that its product contains chemicals which known to the State of California to cause cancer. It also cans birth defects or other reproductive harm. This arrow name contains the Product Manufactures name “Gold Tip”. Gold Trip Company is popular all over the world because of its most innovative, durable, and precise carbon arrows. They hold the place because they manufacture their arrow from the finest aerospace-grade materials. They always maintain the industry’s weight and straightness specifications. That is the way they are the leading provider of innovative outdoor products. Size: 340 (8.9 gpi), 400 (8.2 gpi). Wt. tolerance: ±0.5 gr for unparalleled accuracy and consistency. Dia: .300″ (340), .302″ (400). Q: Do Gold Tip Hunter Pro come with tip inserts? Ans: Yes they do come with tip inserts. Q: Are these the four fletch arrows? Ans: No, they have three fletches. To put it in a nutshell, we can say that Gold Tip Hunter Pro is a versatile arrow which can fulfill your need. 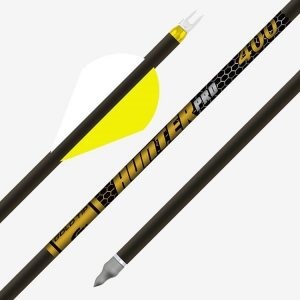 By comparing with other accessories you will be sure that Gold Tip Hunter Pro arrows are amazingly accurate and they are very well made. If you want to choose an arrow for everlasting it should be your definite choice. hunterstrust.com is a participant in the Amazon Services LLC Associates Program, an affiliate advertising program designed to provide a means for sites to earn advertising fees by advertising and linking to Amazon.com. Amazon, the Amazon logo, AmazonSupply, and the AmazonSupply logo are trademarks of Amazon.com, Inc. or its affiliates.